This artist’s concept shows a servicing spacecraft, left, approaching satellite needing assistance. NASA is developing technology needed to bring a high-technology “gas pump, robotic mechanic and tow truck” to satellites in orbit. With satellites playing increasingly important roles in everyday life, NASA is developing the technology to build Earth-orbiting, roving “service stations” capable of extending the life of these spacecraft. Engineers at the Kennedy Space Center in Florida are assisting the space agency’s Goddard Space Flight Center in Greenbelt, Md., in developing the concept for bringing a high-technology gas pump, robotic mechanic and tow truck to satellites in space. There are 149 government-owned spacecraft and 275 commercial satellites currently in geosynchronous Earth orbit, or GEO, around the Earth. Placed 22,300 miles above the Earth, these satellites play key roles in communications, science, defense and weather monitoring. GEO permits these spacecraft essentially to stay over the same point, allowing for constant coverage of a designated position. This is crucial for satellites relaying meteorology and television signals covering specific portions of the globe. According to Tom Aranyos, technical integration manager in NASA’s Fluids and Propulsion Division at Kennedy, engineers at the Florida spaceport are supporting the hypergolic propellant refueling portion of the Goddard-led study examining how free-flying servicing spacecraft could expand options in orbit for government and commercial satellite owners. 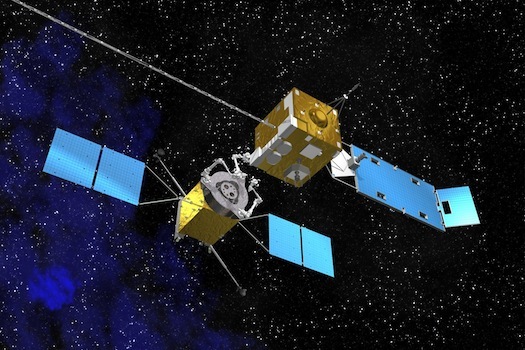 Read more: NASA Centers Work on Satellite Servicing Technologies | Parabolic Arc.